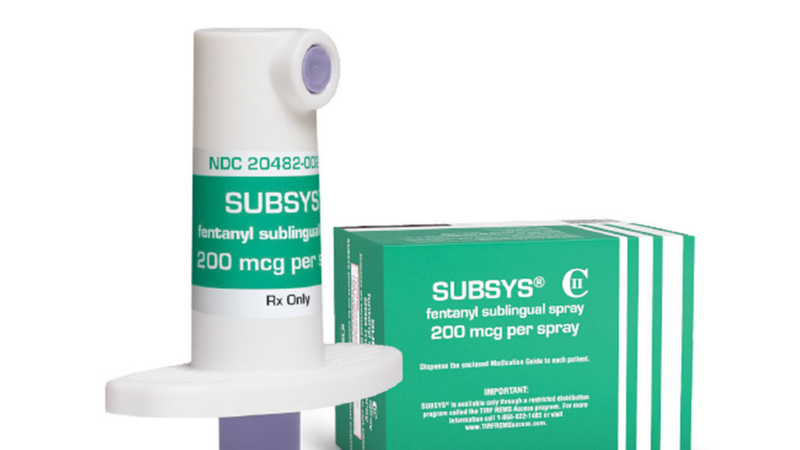 The manufacturer of a fentanyl oral spray called Subsys has been named in a growing number of personal injury lawsuits, after federal prosecutors accused the company of marketing the highly-addictive opioid painkiller for unapproved indications. The nationwide law firm of Bernstein Liebhard LLP is investigating fentanyl oral spray lawsuits on behalf of individuals who were harmed after being prescribed Subsys spray for a non-cancer indication. If you or loved one experienced addiction or suffered an overdose while using this medication in an off-label capacity, please contact our office by calling (888) 994-5118. Subsys spray is a fentanyl oral spray approved by the U.S. Food & Drug Administration (FDA) in 2012 to treat breakthrough pain in adult cancer patients who have developed a tolerance to around-the-clock opioid painkillers. Fentanyl is 10-times stronger than morphine. To lessen the potential for addiction, overdose and other adverse events, the FDA requires that Subsys spray be prescribed via a Risk Evaluation and Mitigation Strategy, or REMS. Doctors are permitted to prescribe FDA-approved drugs for any purpose they deem appropriate. However, drug companies are legally forbidden to market their products for off-label, or unapproved, uses. In October 2016, the U.S. Department of Justice (DOJ) obtained indictments against six former Insys Therapeutics executives for allegedly bribing doctors to prescribe the oral fentanyl spray to patients who suffered from non-cancer indications. Ten unnamed healthcare professionals were indicted as co-conspirators. According to the DOJ, the Insys executives allegedly payed doctors sham speaking fees to induce them to overprescribe Subsys. The medical professionals are accused of conspiring with an Insys “reimbursement unit” to write insurance claims that made it appear as though the oral fentanyl was only being prescribed to treat cancer patients. In June 2017, a former manager at Insys Therapeutics admitted that she had directed employees at the Insys Reimbursement Center to lie to insurers, defrauding them into paying for Subsys. The manager pled guilty to a single count of wire fraud and has agreed to cooperate with the DOJ in its case against the six former Insys executives. Insys Therapeutics has already settled fentanyl oral spray lawsuits filed by attorneys general in Oregon and New Hampshire in connection with its sales and marketing of Subsys. In May 2017, the company acknowledged that the Illinois attorney general was pursuing a similar lawsuit, while investigations were underway in several other states including Arizona, Colorado, Florida, Massachusetts, Maryland, Minnesota, New Jersey, New York, Pennsylvania and Washington. A growing number of personal injury lawsuits have been filed in U.S. courts on behalf of patients who were prescribed Subsys fentanyl oral spray for non-cancer-related pain relief. Among other things, plaintiffs claim that Insys salespeople intentionally targeted healthcare providers who weren’t treating cancer patients in order to drive sales of the drug. More than 80% of Subsys scripts were off-label by the end of 2015, according to complaints. Considering a Fentanyl Oral Spray Lawsuit? Contact a Subsys Lawyer Today. Victims of addiction or overdose allegedly linked to off-label use of Subsys spray may be entitled to compensation for medical bills and other damages. Those who lost a loved one due to Subsys may also be eligible to file a wrongful death lawsuit against Insys Therapeutics. To learn more about filing a fentanyl oral spray lawsuit, please contact Bernstein Liebhard LLP today, at (888) 994-5118.